Professional wrestling fans have a chance to see their favorite sport right in their own back yard. The Upper Beaver Valley Jaycees are sponsoring a professional wrestling show at 8 p.m. Saturday at the Ellwood City High School gym. 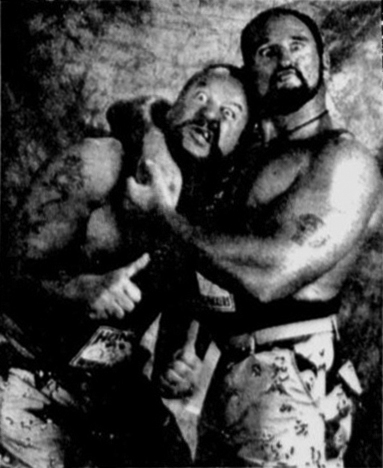 The main event features the Bushwhackers taking on the Batten Twins. Also on the card are: Lord Zoltan defending his junior heavyweight title against the Green Hornet, Psycho Mike vs. Gene Austin, David St. John vs. Cy Youngblood and various others, including K.C. Striker, T.C. Reynolds, Rod Destiny, Skull Gantz and the Milwaukee Mauler. Tickets cost $15 for ringside seats and $10 for general admission. A limited number of tickets will go on sale the night of the show. More information can be obtained by calling (724) 752-2700. This entry was posted in 1998 and tagged Bart Batten, Batten Twins, Brad Batten, Bushwhackers, Cy Youngblood, David St. John, Gene Austin, Green Hornet, K.C. Striker, Lord Zoltan, Milwaukee Mauler, Psycho Mike, Rod Destiny, Skull Gantz, T.C. Reynolds. Bookmark the permalink.